Imagine that you're in Watsessing Park with a time machine … you step inside, set the date to 1850 and press "Activate" on the touchscreen. The time machine does its thing … you step out into a different century … and get very, very, wet! Welcome to Lake Watsessing. Up at the north end, near Bloomfield Avenue, there's a dam. On the other side is a mill – perhaps a sawmill, cutting logs into lumber, or a grist mill, grinding wheat or other grains into flour (no Home Depot or Foodtown in 1850!). The lake, which supplied water at a steady rate to power the mill (green energy! ), was described by the Historical Society of Bloomfield as "large but shallow" and "thought to date from the very early 1800s." But times and technology changed, and by the 1870s, the mill had been abandoned and eventually burned down. When a flood washed out the dam, officials decided not to replace it. Lake Watsessing drained, leaving behind what the historical society called "acres of weeds and odiferous swamps." There were several different attempts to find new uses for the land … the owner of a large section tried to divide it up into housing lots, but it's reported that the surveyor botched the job and owners found their property lines overlapping. Meanwhile, at the East Orange end was another mill pond, powering Dodd’s sawmill, a fixture since the early 1700s. By the late 1800s, that mill was also shut down. In the 1880s, in a progressive move, the City of East Orange installed a sewer system and built a sewage treatment plant near Dodd Street. Apparently, that smelled worse than the "odiferous swamps," and complaints by residents - mostly in Bloomfield - forced the city to shut it down within just a few years. In 1898, according to a Parks Department history prepared for Watsessing's 2016 centennial, East Orange gave the six acres on which the plant stood to the Essex County Park Commission. 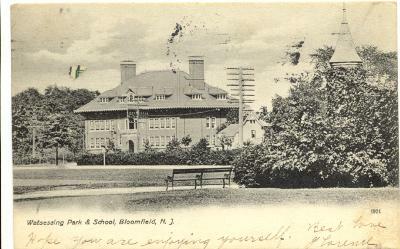 One early proponent foresaw the park as linking Watsessing School in Bloomfield with Franklin School (now the Whitney E. Houston Academy) in East Orange. The county hired the Olmsted Brothers - the era's leading designers of public spaces - to lay out the new park. 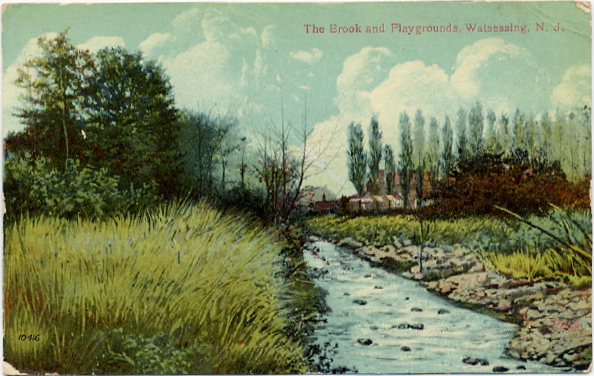 The firm - whose other projects include Branch Brook Park in Newark (the first county park in the U.S.), Central Park in New York City, Prospect Park in Brooklyn, and the grounds of the White House and U.S. Capitol in Washington, D.C. - recommended expanding the park to fill out the block bounded today by Glenwood Avenue, Dodd Street, Cleveland Terrace and Llewellyn Avenue. What is now the southern portion of Watsessing Park opened for public use in 1901. Bloomfield residents worried that the northern lakebed would be turned into another sewage treatment plant, and started campaigning for a county park there as well. The town started buying up portions of the land near Bloomfield Center. In 1911, residents of Bloomfield, Irvington and the Ironbound section of Newark got the state government to allow the Essex County Park Commission to borrow $300,000 (over $7 million in today's dollars) to build more parks in their communities. $60,000 was set aside for expanding Watsessing Park (the rest went to build Irvington Park and Newark's Riverfront Park). By the end of 1911, the county had purchased nearly all the land that now makes up the Glenwood Avenue and Bloomfield Avenue portions of the park, and work began on turning the swamp into a park. 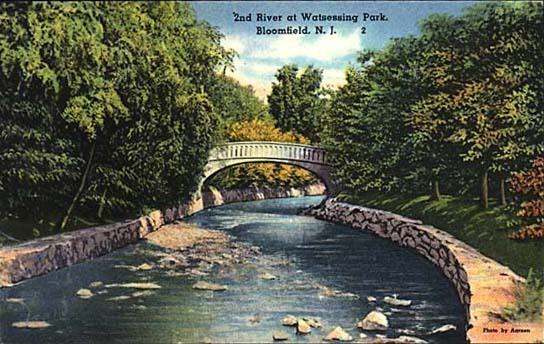 The new portion of Watsessing park opened in 1916, now stretching from Bloomfield Avenue in Bloomfield to Dodd Street in East Orange. The park lost some land to the construction of the Garden State Parkway in the 1950s, but it still provides an oasis of nearly 70 acres in the middle of a densely populated area. In 1924, Watsessing became home to the Essex County Lawn Bowling Club, whose bowling green along Glenwood Avenue was considered one of the best in the nation for many decades. The green fell into disrepair in the 1990s but was rebuilt by the county and opened again in 2006. Today, the club is the only lawn bowling club in New Jersey and once again hosts regional, national and international competitions. In 2004, Essex County opened its first off-leash dog park in Watsessing, along Locust Street, across from Watsessing School. Just about everyone asks that question when they first hear the name. Many assume it's a Native American word, and they may be right … or wrong. There are at least three different explanations of Watsessing's origin, and it is no longer clear which one (if any) is correct. One thing is certain: the name goes back to Bloomfield's earliest days. It's even older than the town itself, which broke away from Newark in 1812. Essex County's Watsessing Park web page says the name came "from the Lenni-Lenape Indians, whose words for 'hill' (watschu) and 'stone' (assan) are combined." The historical society mentions a large mound built in the area by Native Americans, and an 1856 map of Lake Watsessing identifies an "Indian knoll" at the south end of the lake. But it isn't clear if this is the "stone hill" to which the name referred, since even the earliest histories refer to the entire southern end of today's Bloomfield as Watsessing or Watseson. An 1884 history of Essex and Hudson Counties describes early records referring to Watseson Hill and Watseson Plain as early as 1678. But there are two more stories that have nothing to do with Native Americans. It's reported in several places that much of current Bloomfield (and especially the southern part) was known as "Wardsesson" in the late 1700s. One source says this referred to the area being a "ward," or section of Newark. Another says the name may have come from land once owned by the Ward family, which was among the town's first settlers. Finally, there are several references in early histories to "the road to Watsessing dock," although it isn't clear where that dock was located. Pick your favorite story ... any one of them may (or may not) be right! Now … it's time to climb back into the time machine (before any of the 1850 residents notice it! ), dry yourself off, and return to the present day. You'll find that, as it begins its second century, Watsessing Park continues to be the focal point of its surrounding neighborhoods, featuring multiple playgrounds, a running track, a football/soccer field, basketball courts, baseball fields, cricket pitches, a bandstand and a senior citizen center. There's even a weekly farmer's market in the summer. Come play, walk, buy some fresh veggies or just sit on a bench and watch your neighbors enjoy our busy park.